Written in August 2008 and first posted on MyT. 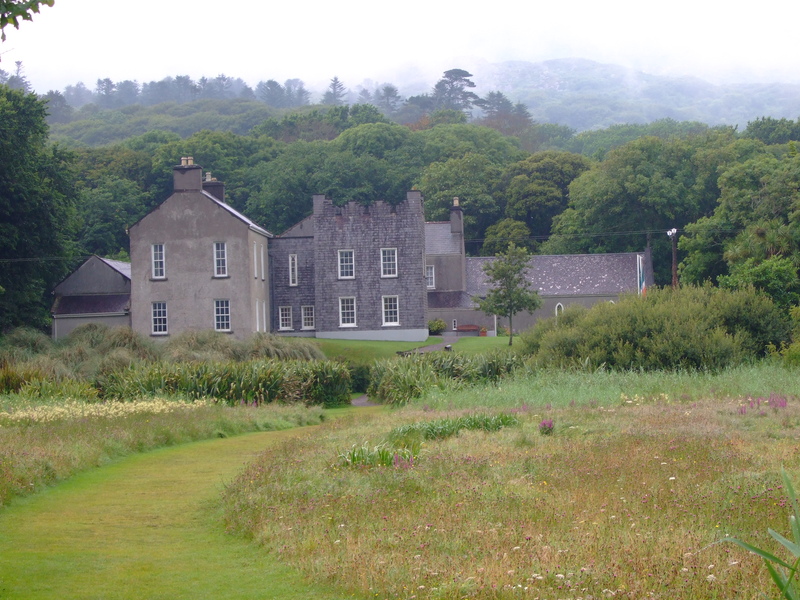 This is Derrynane House in Co. Kerry, the home of the radical Irish political leader Daniel O’Connell (1775–1847) and now a kind of museum to him, which I visited recently. Daniel O’Connell – known as ‘the Liberator’ – is a major figure in Irish history, but barely known in Britain. I discovered this when I lived in Dublin and had English visitors – while we walked past the large statue of O’Connell at the bottom of O’Connell Street, they asked who he was. Of course I’m not saying that they should have known, but there do seem to be gaps in the teaching of history in Britain. In the early nineteenth century O’Connell was a young barrister and orator with an eye for a loophole, who boasted that he could drive a coach and four through any act of parliament. The 1798 rebellion in Ireland, and its bloody aftermath, had given him a strong distaste for violence and he never condoned it in the Irish context, although he supported the wars of liberation in South America (he also campaigned against slavery and for Jewish emancipation). In 1815, having ridiculed Dublin Corporation, he was challenged to a duel by one of its members, Norcot d’Esterre. O’Connell, to his horror, killed d’Esterre … he settled a pension on the widow and vowed never to fight again. O’Connell turned the campaign for Catholic emancipation (i.e. to allow Catholics to sit in parliament) into a kind of national crusade – the nation in question being Ireland. In 1828 he stood against the government candidate in the Clare election, and had a landslide victory. The following April the British government, fearing another rebellion in Ireland, conceded Catholic emancipation. O’Connell next focused on having the Act of Union (1800) repealed – he was a moderate nationalist and favoured a ‘Home Rule’ parliament under the British monarch rather than a republic. He organized several ‘monster meetings’ around the country, one of which was attended by three-quarters of a million people on the Hill of Tara, former seat of the high kings of Ireland. In his house I saw an original poster in which he called on his followers to behave impeccably, declaring that this would infuriate their opponents. A meeting planned for 8 October 1843 in Clontarf, Dublin (scene of an important battle in 1014) was due to be the biggest of all – crowds were already making their way there when Robert Peel banned it on 7 October. Rather than risk violence, O’Connell called off the meeting; he was then imprisoned for conspiracy, and served three months. On his release, 200,000 supporters followed his fabulously ornate carriage (funded by well-wishers, and now on display in Derrynane) through the streets of Dublin. O’Connell, approaching his seventieth birthday, had gone as far as he could. Stricken by illness, he left Ireland in January 1847 with the intention of dying in Rome, and made a speech in the House of Commons en route. He died before reaching his destination, at Genoa on 15 May. Ireland was in the throes of the Great Famine, and at its lowest ebb. Balzac said that O’Connell incarnated a whole people. He was a man of vast energy and charisma, a folk-hero who became a stock character in hundreds of Dublin stories – as ‘Dean Swift’ had been before him – and one of the great characters of Irish history. The Pope managed to draw an even bigger crowd in 1979, I’m a little ashamed to say … couldn’t happen now. Educated in Douai, died in Genoa, head buried in Rome. Great European. Yes, moo`… his outlook was international and he was interested in North and South America as well as Europe, as I mention in the post. He was honoured at the time by anti-slavery people in the USA, as documents in his house show. Yes, Cymbeline. He was a Papal Count. Hello, hmb. What did you do with the snake? Still got him. He’s feeding OK but he’s a bad tempered wee blighter. No-one is responding to the ‘found’ ads, so I suspect he was dumped in the park. Mrs hmb has not warmed to him (yet). Oh God, HMB. DOn’t mention the m word. Great blog Brendano. I will have to ask my inlaws a bit about this when we go over to Dublin. Posts like this make me realise just what we were missing out on at school. Glad you liked it, Claire. You’ll probably walk down O’Connell Street and over O’Connell Bridge when you’re in Dublin. Just as well there’s no duelling these days, or bloggers would constantly be bumping each other off. I will look out for that name, O Connell, when I go over there. We haven’t been for a couple of years – logistics of getting us all together with littl uns etc. Sounds such a cliche but I’m always amazed by the friendliness of people in Dublin. Yes, the GPO is in O’Connell Street, Cymbeline. Probably the most famous building in Ireland. I think my wife’s grandmother worked there at the time of the Easter Rising. For my work, I needed to look at some Irish parliamentary debates the other day … they’re all online. For interest, I looked at the very first one, for January 1919. That was when the Sinn Féin representatives elected to Westminster met in Dublin instead and declared a republic. The roll is interesting. All the names are given in Irish, and all MPs elected for the whole island (no partition yet) are listed. Some are marked absent (obviously Unionists), and quite a few are marked ‘(imprisoned by foreigners)’. hmb’s poor mice were out of luch. They are available in the ‘frozen luch’ section of the pet shop. If Hissing Sid decides to stay I should grow my own since I am not sure that shop bought pinkies are well treated during their short lives. Is crua an saol don luch beag. If that is Gaelic for ‘wee hmb is a warm hearted softie toward luchan’ then I must concur (except I am not wee). Bionn hmb cineálta le gach créatúr (seachas lucha). The first was was ‘Life is hard for the little mouse’. In more robust parts they feed the little critturs live.